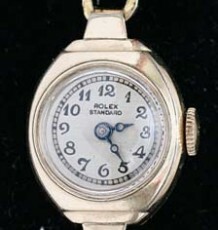 A classic vintage watch, dating to 1966 based on the date code in the watch. 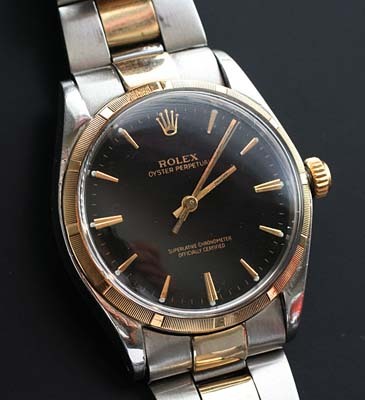 This vintage Rolex Oyster Chronometer also uses the famed 1570 perpetual movement. The all original glossy black dial on the vintage Rolex makes it very difficult to photograph. The dial is a very deep black with gold text indicating that this is a Certified Chronometer. The dial also features tapered or slight arrowhead shaped hour markers. Inside the Oyster case is a Rolex calibre 1570 Perpetual automatic movement. 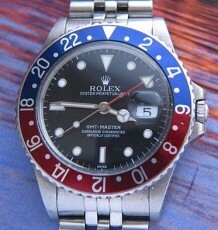 My Rolex trained watchmaker has given the watch a clean bill of health and is working as it should. 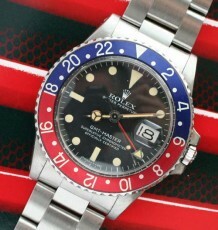 The watch is fitted with a genuine Rolex 2 tone Oyster bracelet which has very little sag in it and locks securely. The watch measures 34 mm wide by 40 mm long. 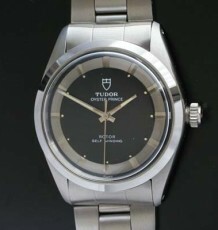 Tudor Prince Oyster Pie Pan dial, New Old Stock.